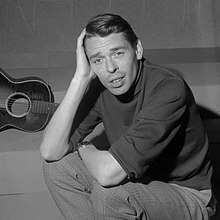 Jacques Brel (8 April 1929 – 9 October 1978) was a Belgian singer-songwriter. He was widely said to be a master of the modern chanson. Although he recorded most of his songs in French, he became a major influence on English-speaking songwriters and performers. Some of these were David Bowie, Leonard Cohen, and Rod McKuen. English translations of his songs were recorded by many top performers in the United States. These include Ray Charles, Judy Collins, John Denver, the Kingston Trio, Nina Simone, Frank Sinatra, Scott Walker, and Andy Williams. In French-speaking countries, Brel was also a successful actor, appearing in ten movies. He also directed two movies. Le Far West was nominated for the Palme d'Or at the Cannes Film Festival in 1973. Brel died of lung cancer. He has sold over 25 million records worldwide. He is the third best-selling Belgian recording artist of all time. ↑ RFI Musique "Jacques Brel" Check |url= value (help). Retrieved 6 September 2011. ↑ Ruhlmann, William. Allmusic "Jacques Brel" Check |url= value (help). Retrieved 30 August 2011. ↑ IMDB "Jacques Brel" Check |url= value (help). Retrieved 30 August 2011. ↑ IMDB "Jacques Brel" Check |url= value (help). Retrieved 31 August 2011.